No tours today. 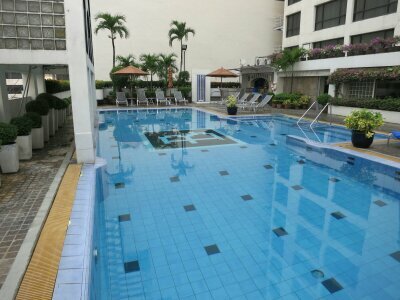 So I started the day with a swim in the hotel pool before we had breakfast. There is a sky train station, Nana Station, only a few minutes walk from our hotel. The trains run about every 10 minutes (at least during the day when we travelled) and are easy to use. Signs and directions are in English. 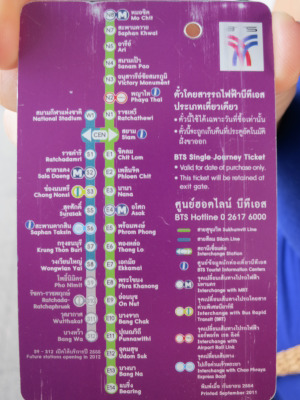 At the station, and on the back of tickets is a network map. You buy a ticket based on the distance you travel. You don’t have to nominate a station. 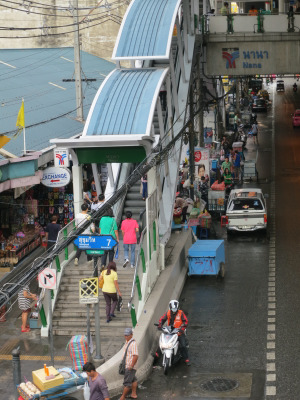 We caught the sky train to Siam station and from there walked to the shopping centres. We walked through the two biggest stores in Siam and were not impressed. The centres are very modern, even trendy. But expensive with the prices that same as we’d pay back in Sydney. Actually the prices were what you could pay in the expensive store in Sydney but I never would, so I wasn’t going to pay those prices here. Like $100Aus for tiny ladies singlet top. The centres were almost void of customers too so either we were too early or others didn’t like that type of shopping. We left the shopping centres and walked through some of the little off street stall/shops in Siam. Prices were much better here. I bought a T-shirt for $10 and Julia got a skirt for $16. We walked to the nearby MBK centre where we had been before and did lots of shopping here. Eventually my feet got too sore to continue so Julia left me at a Starbucks while she continued to shop.